By now you have surely heard the name Lauren Wireman. Not only is this nail tech an extraordinary artist, competitor, and salon owner, but she now has her sights set on starting a nail school. In order for Wireman to better serve the techs of tomorrow, she is getting creative by focusing on all their needs, not just education. “I went through a phase at the beginning of my career when I thought I was invincible, but it only took getting acrylic in my eye twice to realize that I needed to protect my eyes when doing nails,” says Wireman, which is why created NailSpex. 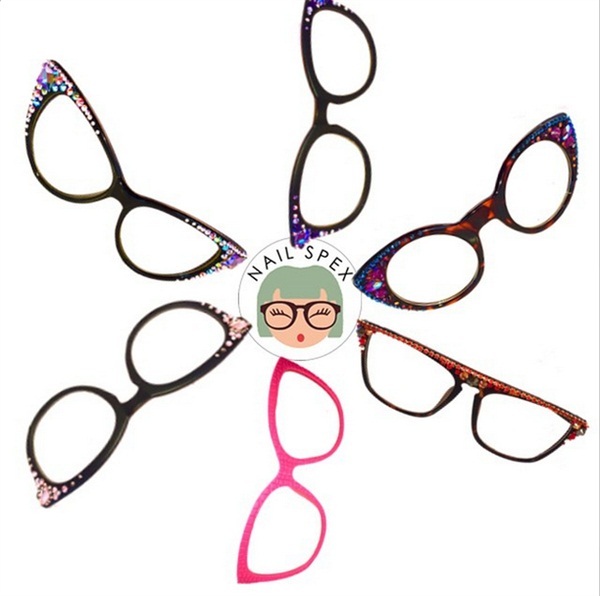 NailSpex are stylish glasses made just for nail techs to shield their eyes from flying Swarovski crystals and other nail debris. The lenses made out of clear polycarbonate and are thinner and lighter than regular plastic lenses and are up to 10 times more impact-resistant than plastic or glass lenses. Readers or “cheaters” are also available as well as blinged out options with genuine Swarovski crystals, or you can buy the frames and bling your own. All of the profits go to the start-up and accreditation of Wildflowers Nail Academy. Plain glasses start at $12, available online now at www.nailspex.com. Wireman will also have them available at The Nail Tech Event of the Smokies. NAILS is giving away a pair of NailSpex to five lucky winners. If you want to win cute specks for smart techs, leave a comment below telling us what pair you have your eye on. For an additional entry, follow @wildflowernailshop on Instagram and tell us when you have done so. We will pick five winners at random (U.S. only) on Monday, April 27.